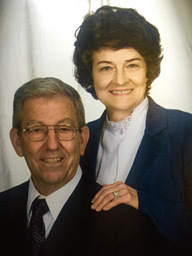 George Gil has been director of Christian Family Outreach since 1985. He is an author of 2 books on Marriage, as well as countless pamphlets and magazine articles. He was born in 1942 in Eunice, Louisiana, graduating from Eunice High School in 11 years instead of the customary 12 years. He moved to Morgan City to work in the oilfield as an offshore pumper, then promoted to training and safety supervisor. He married Gwendolyn Callahan in 1966, and raised a family of 11 children. At the age of forty-two, he retired from Halliburton while his eldest child was still in school. George started a residential construction company, Gil Enterprises, and a multi-million dollar real estate business, Gil Rentals, so that he could teach his sons and daughters to be financially independent, and being financially independent, have the time to spend with their families to raise them in the catholic faith. His daughter, Andrea, is a Poor Clare nun. George is a man of his word and has spent his life in service to God through writing, speaking, and counseling many people in areas of family life, finances, and faith in Christ. Through his apostolic zeal and leading by example, he has helped countless souls discover Gods plan. George has spent his life in dedication to his fellow man and to almighty God. George is a past member of the Knights of Columbus and the Third Order of St. Francis. He is currently active in the Cursillio movement, and serves as host to the Ultreya that meets in Garden City, Louisiana. An avid writer, he spends most of his time writing new material, and enjoying his 65 grandchildren. George and Gwen currently reside in Garden City, LA. William Gil has been married to his wife Candy (formerly Candice Martin) since 1991, and they currently reside in South Louisiana where they were both born and raised Catholic families. William and Candy are enjoying a beautiful, lively and happy family life. They have 9 children, 3 boys and 6 girls, born from 1992 to 2010, and they are homeschooling as well. William is of many diverse talents providing for his family as a real estate investorand property manager since 1985. He is a Homebuilder since 1984, a Louisiana licensed residential and commercial building contractor since 1998, and an International Building Code Council Certified Building Inspector and Plans Reviewer since 2007. His family has been in the real estate business since 1970. Gil Enterprises has built over 300 dwellings in St Mary Parish, contributing in a large way to the growth of that area. He has served as president of Patterson Rotary, Morgan City Kiwanis, South East Louisiana Home Builders Association, Building Officials Association of Louisiana and Gulf Coast Region 9 International Building Code Council. He has served the State of Louisiana as board member of the Louisiana State Uniform Construction Code Council, and he is past chairman of the City of Patterson Main Street Committee. And St Mary Parish Planning and Zoning Commission. William purchased the domain "Christian Family Outreach" and was the first webmaster in 1999. Following webmasters were Joel Ohmer, Dean DeMers, and currently, Jim Pierce Computer Service. William is co founder of Fix the Family, with Raylan Alleman. Fix the Family is a lay Catholic Apostolate formed to aid and support Catholics, married or aspiring to marriage, in making their marriages rock-solid and raising their children to be strong in their Catholic Faith empowering them to resist the pull away from the Church by emphasizing authentic masculinity and femininity and offering a practical application of the solid teachings of the Catholic Faith. He is active in his church parish, having served as St Bernadette Parish pastoral council chairman and committee chairman for the Lafayette Diocesan Pastoral Council. He is active in the Cursillio movement and member of the Knights of Columbus. William enjoys music as a hobby and has recorded 7 albums of original music with his principal instrument being the piano. He has been doing video and photography since 1985. He currently is director of photography and producer for many online programs, and his work has an international audience. His full length feature movie,Seelos: Doctor of Souls, has aired on PBS in the New Orleans market area over 25 times, and has been viewed by over half million people. William is currently employed by FEMA , as an building inspector, and Holiday Inn as an Internet Technology Manager and Building Inspector.